But, more about the mushrooms. If you haven’t already noticed, I’m a little obsessed with stuffing things lately. There’s something about the most miserable stretch of winter that makes me want to fill my food with more food and find excuses to bake everything. This dish was a lovely combination of creamy (thank you, nutritional yeast, you cheesy wonder) and fresh—lemon juice & green onions adding a touch of springtime. Plus, check out those cooking directions! Couldn’t be easier. January’s almost over. We can do it. For now: stuff, bake, eat, repeat. Dice onion, green onion, and garlic. Sauté over medium heat until the onions are translucent. Drain tofu of its water and crumble it by hand into the pan. Add nutritional yeast, turmeric, lemon juice, pepper, and salt. Cook for 5 minutes, stirring occasionally. Cover a baking sheet with parchment paper. 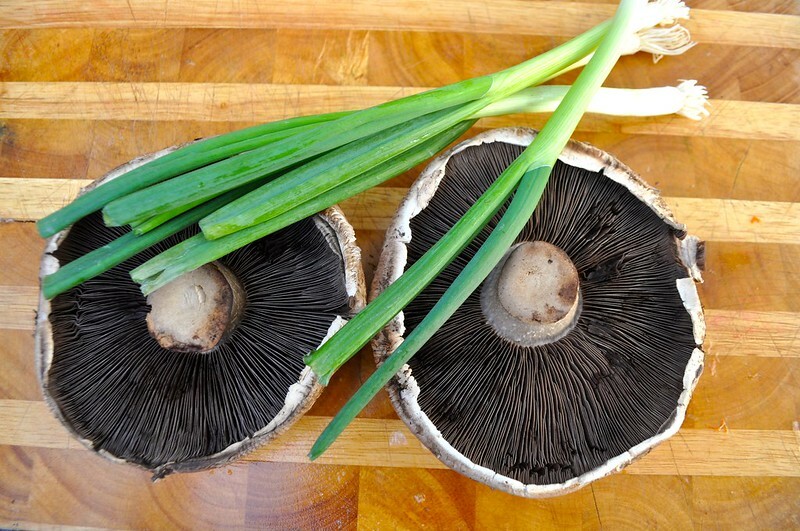 Pour a few drops of olive oil into your hands and gently rub portobellos with the oil. Place mushrooms onto the parchment paper and scoop the scrambled tofu on top of the mushrooms, using the spoon to sculpt the tofu into compact mound. 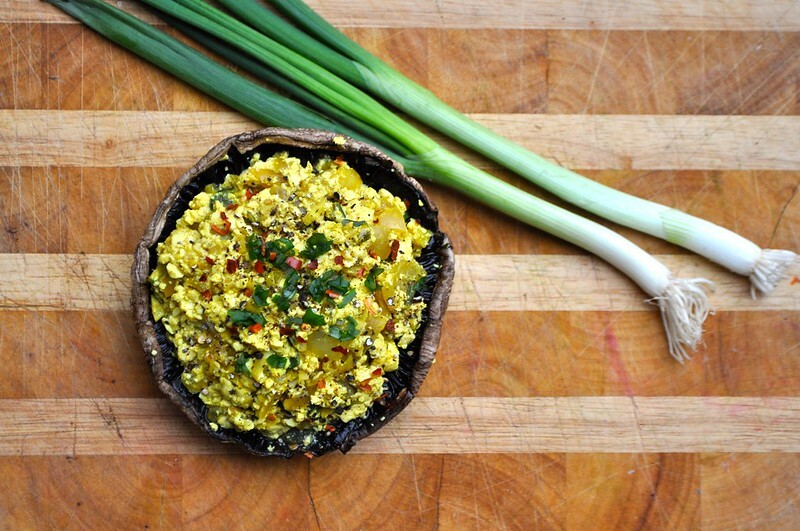 Fill the mushrooms with as much scrambled tofu as possible. Put the mushrooms in the oven and bake for fifteen minutes, until they are tender. Remove and serve immediately. This entry was posted in entree, Uncategorized and tagged food, green onion, Italian, mushroom, nutritional yeast, onion, portabella, portabello, portobella, portobello, recipe, stuffed, stuffed mushroom, stuffed portobello, stuffing, tofu, vegan, vegetarian, veggie burger. Bookmark the permalink.